It’s time for all the gearheads out there to get their engines into gear with round one of the FIM Superbike World Championship 2016 fast approaching. The iconic event is being held at Phillip Island from the 26-28 February, and this year is shaping up to be another great moment in world motorsports with former superbike champions like Jonathan Rea, Tom Sykes, and Sylvain Guintoli set to go head to head once again and the largest number of Australian riders competing in years. Melbourne On The Move is running coaches to Phillip Island from Dandenong, Melbourne, and Cranbourne over the three days so you don’t have to worry about getting there and back, but there are plenty of other things to consider when planning your trip so we thought we’d make you a handy guide. The 2016 race is lining up to be another epic battle amongst some of the biggest name in motor racing as well as plenty of local favourites. Round one 2015 champion Johnathan Rea is returning to defend his title against a whole host of fresh Australian faces including Josh Brookes, Josh Hook and Mike Jones as well as many old rivals. This year 20% more racing has been packed into the three days, so you’ll need to plan carefully to make sure you don’t miss out on any of the highlights. Aside from the races themselves, there are plenty of entertainment options onsite to satisfy diehard motorbike fans. Choice options include the Super Go Karter of the Year competition running over the three days (winner receives a grid pass for Sunday’s race), scenic helicopter flights taking you over the racetrack, and high flying freestyle motocross performances in between the events. If you decide to stay on the island for the duration of the event, you have the option of camping on the grounds or staying in one of Phillip Island’s many idyllic seaside towns. Camping on the site provides you with easy access to the races and in some cases a prime view of the racetrack. The campsite is split into two zones; Zone 1 is a powered site which is in a quieter area away from the track whilst Zone 2 is an unpowered site where you can get a spot right along the North East fence line. For those who can’t live without their creature comforts, there are plenty of comfortable motels in the main town Cowes and just off the island in San Remo. Our Melbourne coach services will get you there and back but once you’re on the island there are a number of ways to get around. 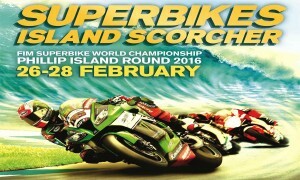 For the superbike event, a special shuttle bus service has been organised around the island and there is also a dedicated island taxi service to get you where you need to go. Book your seats on the Superbikes Championships coach today via our website or call us regarding any queries about sports event coach hire on 1300 558 686.